Scotland, a country on the northern part of Britain, has a Jewish community that may date as far as back as the late seventeenth century. Although there are records of applications by individual Jews for rights of trade and residence in Edinburgh as early as 1691, and there is reason to believe that a short-lived congregation was established there in 1780, the first organized Jewish community in Scotland, that of Edinburgh, was not established until 1816. Although there are records of applications by individual Jews for rights of trade and residence in Edinburgh as early as 1691, and there is reason to believe that a short-lived congregation was established there in 1780, the first organized Jewish community in Scotland, that of Edinburgh, was not established until 1816. It was followed shortly thereafter by that of Glasgow. A few Jewish students and professors attended and taught at Edinburgh University. One Jew, David Brown, was permitted to live and trade in the city. The first Jewish graduate from Glasgow University in 1787, Levi Myers, graduated without having to take a religious oath. Not having to swear this oath attracted many Jewish students to Scotland, since all English universities required such an oath to be said at graduation. Glasgow only had some 20,000 inhabitants in 1740, but increased in population to about 84,000 within sixty years. With this population growth Glasgow also developed international commercial relations, in which Jews played an important part. As Glasgow grew, so did the number of Jews, with the first reference to an actual Jewish settler in Glasgow in 1812. Eleven years later there were enough Jews in Glasgow to open a synagogue in a first floor apartment. The Jewish community, however, continued growing and in the late nineteenth the Garnet Hill Synagogue was built. The mass immigration from Eastern Europe in the late 19th and early 20th centuries brought many Jewish settlers to Glasgow, but comparatively few to Edinburgh. In 1918, Dr. Salis Daiches became minister of the Edinburgh Hebrew Congregation. During the course of his ministry, which lasted 27 years until his death, he had a profound effect on the Jewish community. He united the community into a single cohesive unit and at the same time acted as spokesman for the Jews in Scotland during the troubled inter-war years. The Synagogue in Salisbury Road, built in 1932 to accommodate 2000 people, is a tribute to his leadership and vision. On Dr Daiches’ death in 1945, the community appointed Rabbi Dr Isaac Cohen, who subsequently became Chief Rabbi of Eire. Today, there are two synagogues in Edinburgh, Reform and Orthodox, and the Edinburgh University has a Jewish society. 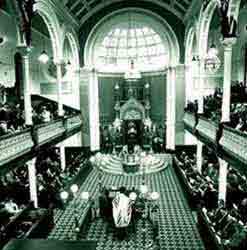 In Glasgow there are six synagogues, including Reform, Orthodox, liberal, and Lubavitch synagogues. There are also two mikvahs in Scotland, one in Glasgow and one in Edinburgh. There is also a Scottish Council of Jewish Communities, and a range of Jewish institutions, especially in Glasgow. Of the 15,000 Jews living in Scotland in 1971, all but some 220 resided in Glasgow (13,400) and Edinburgh (1,400). The remainder were distributed in Dundee (84), Ayr (68), Aberdeen (40), and Inverness (12). In the mid-1990s the Jewish population of Glasgow dropped to approximately 6,700 and that of Edinburgh to approximately 500. According to the 2001 British census, approximately 6,400 Jews live in Scotland, making up 13 percent of the overall Scottish population. Approximately 4,224 declared Jews by religion in Glasgow, 763 in Edinburgh, 30 in Aberdeen, and 22 in Dundee. Since the Jews arrived in number at the turn of the 19th century they have been a huge presence in Scotland in all walks of life, including community leaders. However, the community is in decline and increasingly feels isolated and undervalued. Too often concerns over the policies of Israel are conflated with open hostility to Jews resident, visiting or studying in Scotland. Ignorance is the champion of much anti-Semitism and ever has it been. 1. Chabad Minyan Known as Shul in the Park holds services on Shabbat mornings, Friday evenings, Monday morning and evening and Wednesday mornings. For times of services please send an email. 3. Netherlee and Clarkston Syn, Clarkston Rd, corner Randolph Dve. Rabbi Refuel Bokov. Tel: 0141 637 0863. 4. Newton Mearns Synagogue, Larchfield Ave. Newton Mearns. 5. Langside Synagogue, Niddrie Rd. Glasgow G41 two minutes walk from the Ewington Hotel Tel. +44 (0)141 423 1152. 6. Garnet Hill Synagogue, Garnet Hill St, off Sauchiehall St in the Glasgow City Centre near Charing Cross area. This Shul only has a minyan on Shabbat morning starting at 10.00am. Rev Aaron Soudry Tel. +44 (0)141 639 7730. 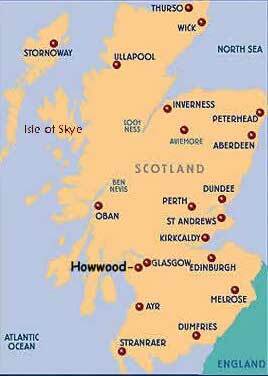 The idea of creating a Reform Jewish community in Scotland was born in 1931. Always existing near to the heart of the Jewish community in Glasgow, the Glasgow New Synagogue/Or Hadash building has moved as the Jewish population moved. Recently renovated to accommodate the growing need for more classroom space, the modern, elegant building has attracted great admiration for its lovely space and clean lines. It now finds an excellent home in the extreme south of Glasgow, Newton Mearns. Or Hadash is the only Reform Jewish community in Scotland, drawing its members mainly from the Glasgow area but with members from the Edinburgh area and as far afield as Aberdeen and Kirkcudbright. Or Hadash is the second oldest synagogue in Glasgow. Jackson Carlaw, “Scotland's Jews are entitled to feel safe and valued,” The Herald, (January 5, 2019).